Et des hyvers fait des printemps nouveaux. Et tous muets s’accoisent les ruisseaux. Ne la ravisse et ne l’emporte aux cieux. And make from winter a new spring. And quietly the streams rise. Steal her away and carry her to the heavens. Once more Cassandre is accompanied by a cluster of classical virtues. Today we have the Dioscuri – Castor & Pollux, the twins – who here must be invoked in their capacity for bringing favourable weather (though that’s usually for sailors). Aeolus is god of the winds, and Zephyr one of his charges. Characteristically, Ronsard injects himself, and a humorous perspective, into the poem – the earthly lover terrified lest these deified virtues make off with his beloved. The only difference in Blanchemain’s edition is the beginning of line 11 – “Mais, las ! je crain que qulequ’un … ” (‘But oh! I fear lest one …’), which is clearly improved in the later version. Although the poem is about the marigold, the French word also means ‘cares’ or ‘worries’ – particularly in Ronsard, the troubles of a lover. Here there is a subtext throughout, a message to his lady about the pain she causes him. The title in Blanchemain’s version, ‘the marigold in the garden’, sets the expectation of a rather less ambiguous poem, perhaps. Jaunes, luisans et dorez sur le front. Et fut depuis aux Spartes un grand Dieu. Au moins, Souci, s’il n’est vray, je le croy. Tu es, Souci, mon frere ce me semble. Pour trop d’amour qu’effacer je ne puis. Printemps, Hyver, le soin d’amour me dure. Si son œil est ou farouche ou troublé. Un seul Soleil te donnant mort et vie. Si qu’esblouy je ne cognois personne. Tient mon esprit aux Astres attaché. Que tu guaris de la melancholie. Et je veux bien me consommer pour elle. Vive amoureux et n’espargne le temps. Par la douceur de tant de beaux accords. Ou s’il n’est vray, je me console ainsi. De l’autre ardeur il me faut contenter. Are they, shining gold on their brows. And was afterward a great god to the Spartans. At least, marigold, that’s what I believe, true or not. You are, marigold, my brother, it seems. From too much love, nor can I wipe it away. In Spring and Winter, love’s cares linger in me. If her eyes are either timid or troubled. The Sun alone bringing you death and life. So that, dazzled, I recognise no-one. Keeps my spirit bound to the stars. And I’d willingly consume myself for her. Let him live, love, and not spare of his time. Through the sweetness of so many fine harmonies. Or so I console myself, even if it is not true. With that other passion I must content myself. We met Guillaume Cherouvrier a while back in one of Ronsard’s more cynical poems, so it is good to find him here as the recipient of something far less cynical! You may recall he was a member of the Royal Chapel, hence the reference to ‘his music’ near the end of the poem. I should just mention the ‘double / single’ antithesis in the middle of the poem. Ronsard’s words are “double / simple”, so that each time something is ‘single’ it is also ‘simple’. I have reluctantly chosen ‘single’, so that the antithesis works, but I feel that the other meaning, of simplicity, is really the one that should come through! Jaunes, luisans, et dorez sur le front. Tu es, Soucy, mon frere, ce me semble. Par la douceur de mes divers accords. Me fait gaillard et me tient en vigueur. D’escrire en vers il me faut contenter. Through the sweetness of my varied harmonies. Makes me jolly and keeps me vigorous. With writing in verse I must content myself. Note that the variant of line 3 is placed by Blanchemain in a footnote and his ‘preferred’ text retains the same line 3 as in Marty-Laveaux. In mid-poem I find the text “dans l’ame” odd – it scans but only painfully, and the revised version (“dedans l’ame”) works so much more easily! Comme enfans naissent au monde. En nos cœurs nous fait la guerre. Qu’il emprunte de ma Dame. Sa douce voix qui m’enchante. Sa belle taille et sa gréve. D’elle prend vigueur et vie. Que je verrois frizer d’ondes. Il y a de fueilles vertes. Et seule tu n’en as cure. Qui font l’amour sans contrainte. Like children are born into the world. Makes war on us in our hearts. To go and see her Anchises. Which it has borrowed from my Lady. And her supporting my neck. Her soft voice which enchants me. Her lovely shape and size. Of her fair breast, swelling. The softness of her breath. Takes from the other its strength and life. That I’d see waves curling. Green leaves in a wood. And only you care not. Make love with beak and wings. Who make love without constraint. Kiss me again, my goddess! These years of our youth! 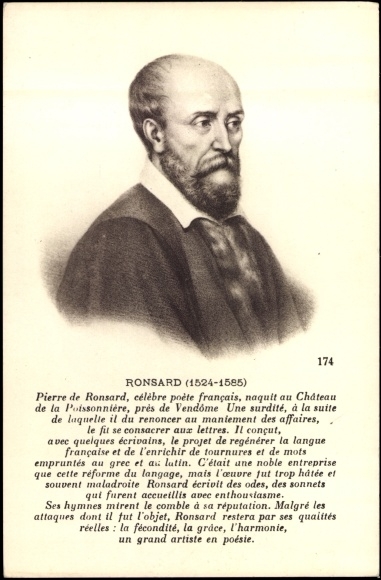 One of Ronsard’s most famous poems – and deservedly so. We met Venus & Anchises recently; also Zephyr the warm west wind. He carries deep in his breast. Seule à seul ma bien aimée. Alone with my beloved alone. Additionally there are a few minor changes: in the 3rd stanza Love looses “Feu et dards” (‘His fiery darts’) in the 2nd line; 3 stanzas later, beneath her feet “Croissent mille fleurs écloses” (‘Grow a thousand flowers blooming’); and just before Zephyr (above) he hears the soft voice “Du beau rossignol” (‘Of the fair nightingale’) in the woods. Incidentally, I love the way (in the middle of the poem) he bends the word ‘tetin’ into ‘teton’ to rhyme with ’bouton’, and makes it sound like a form of endearment at the same time! En juin ne te fasse laidure ? Nous ramene le beau printemps. And winter take the sun’s place. And the white flower of Mars. In June never make you ugly. Is bringing us back the fine springtime. Once again a beautiful little lyric. And once again the elusive ‘flower of Mars’ appears! Et jamais juin ne te fanisse ? And that June might never fade you. Baignent mes yeux de deux ruisseaux de pleurs. These bathe my eyes with two streams of tears. Unusually for Ronsard, a sonnet in a 13+1 form: he doesn’t often pursue the same thought all the way to the penultimate line, though that is what here makes the sudden switch to tears instead of joy in the last line a decisive dramatic stroke. If you can improve on ‘outside herself’ please do – I am stumped for a decent translation at the moment! Où sans espoir mes esperances paissent. Where my hopes feed without expectation. Sometimes a poem looks like it came out fully-formed, and sometimes you look at a poem and think ‘the poet clearly set himself a puzzle to work out here!’. For me this has the look of a poem in which Ronsard wondered how long he could keep going with “Ny…” lines and ‘random’ images, while still making a satisfying poem. As my own little tribute – after all, starting the line the ame each time is easy enough – I’ve added an extra ‘No…’ in line 13…! Just some small changes from Blanchemain’s early version: in line 3 he has “chants de luth” (‘songs of the lute’), changed above so that the ‘s’ is echoed in the second half of the line – an improvement I’d say; and the last 2 “Ny…” lines (11-12) are “Ny les Sylvains qui les Dryades pressent, /Et jà dejà les domptent à leur gré,” (‘Nor the Wood-folk who pursue the Dryads /And quickly overcome them as they wish’). Note that, in this early version, only 11 (not 12) lines begin with “Ny”!